Churros! Dulce de leche! Three tiered sambos! Sugarloaf Patisserie is a haven of empanadas, churros and dulce de leche sweets. You’ll find the triple layer sandwiches in the display cabinet, planks of soft white bread already made up with fillings and wrapped in cling film. The corner patisserie does a strong trade in takeaway but there are about half a dozen tables scattered inside or on the footpath for eat-in customers. They’ll put your order on a plate, but it’s DIY cutlery and napkins from a table on the side. Lunchtimes are busiest, and there’s a reassuring number of South Americans getting their empanada fix. The meat and olive empanadas are one of their biggest sellers, a hefty pocket of mince, egg and olive wrapped up in pastry. Behind the counter are wire racks stacked with medialunas, the South American version of the croissant commonly eaten for breakfast. They also do sandwiches de miga. If you were one of those kids who never ate their crusts, this is the sandwich for you. Sandwiches de miga (miga means crumb, ie. 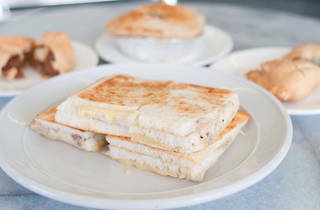 the part without the crust) are triple-decker crustless sandwiches, popular across South America, especially Argentina. The slices of bread are super-sized, made from a special loaf of soft white bread cut lengthwise. The crusts are cut off then the bread is buttered and assembled in a towering triple decker sambo of your childhood dreams. 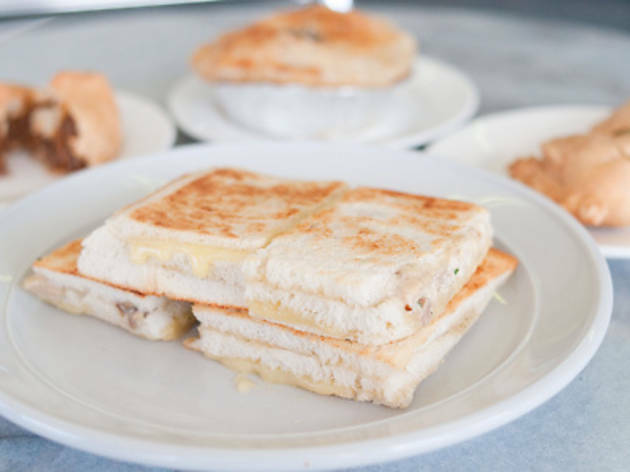 The miga sandwiches come in a variety of choices but cheese is the key ingredient in all of them. A limited menu of ham, tomato or salami is offered on weekdays but come the weekend it’s party time with tuna, chicken, corn and egg added to the list. You can eat them fresh as is, but really, you need to have this toasted so the cheese melts into an oozing goo. It’s hard to resist the trays of churros, deep-fried doughnuts stacked like miniature logs of wood on top of the counter, glistening with sugar crystals. Scoff them plain or dip them in a pot of chocolate or caramel sauce ($5.50 including two plain churros) but we say go the full monty and get the caramel churros that are piped with a sticky filling of thick sweet dulce de leche caramel. If you’ve still got room in the tank, get into an old school vanilla slice with layers of flaky pastry, a cloud of vanilla custard and chocolate-streaked icing on top.